Seriously Penrith... a Black Cat runs on the field and it's bad luck for YOU!!! How's that work exactly? But Cronulla were excellent - great win. And look - we are at 70% for the year! 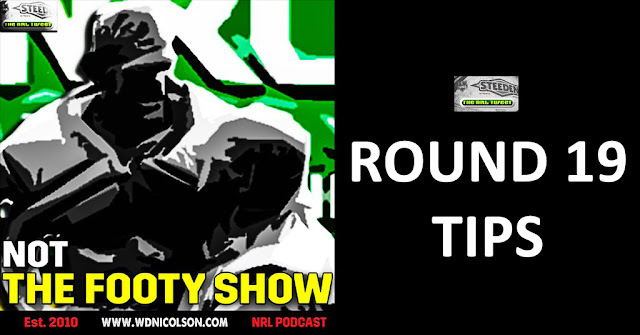 Round 19 Tipping Skinny: I'm guessing on Friday with Titans having more zip but Dragons defence their only asset with no Dugan or Marshall... Manly-Warriors is a coin-flip in Perth, Broncos should beat Inglis-less Souths, Storm over Knights thanks, Panthers over Eels who are Norman-less and Sharks should regroup to beat Easts but it's no slam dunk as Easts are putting out a good side.